Snap calls these programs “Shows.” Think “HBO of the Smartphone,” but supported by ads. Not YouTube, full of random crap. Not Facebook, where you accidentally watch videos. But a curated destination, with the same reliable quality you’d expect from a classy channel like HBO. Snap could use this revenue stream. It just priced its upcoming public offering below its original target after its financials looked a bit shaky in the IPO filing. Snap’s hardware, like Spectacles, isn’t making money yet, and probably won’t for a while. Instagram already has more Stories users and is aggressively courting advertisers for its Snapchat feature clone. Other than through sponsored creative tools, chat is tough to monetize via ads without feeling interruptive. And while a constant stream of Discover editions fill Snapchat with professional content, they’re not the marquee, must-watch stuff that could drag new and lapsed users back into the app. That’s why there’s a huge opportunity for Snap to bring zeitgeisty entertainment specials to its app. Snapchat Shows appear as featured tiles beneath your friends’ Stories and in the Discover section. Snap earns money from them by inserting Snap Ads into the episodes, and uses some of that cash to pay the creators. Just like in Stories, viewers can tap to fast-forward to the next scene, encouraging tight editing without the filler moments you might see in a 30-minute or hour-long TV program. Tomorrow, Snapchat will debut its biggest Show yet, BBC’s Planet Earth II, and it comes with a huge sponsor: Goldman Sachs. The financial firm’s Snap Ads will run in Planet Earth episodes. 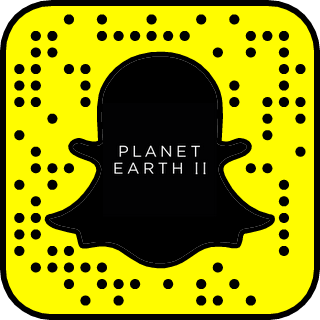 People can subscribe to watch Planet Earth II and get a sneak peek by pointing their Snapchat camera at this QR SnapCode and pressing on the screen. And today, Snap is announcing a partnership with Discovery Channel to make MythBusters and Shark Week into Snapchat Shows. Plus Snap has deals in place for more shows from Turner Broadcasting System and Time Warner channels Adult Swim and TBS, and an A+E show called Second Chance. Plenty of video platforms are trying to produce mobile-first, professional, original content. There’s YouTube Red series like Lazer Team and the forthcoming experiments Facebook is working on. But these are typically trying to build new brands, rather than re-imagining fan favorites for the small screen. Snap’s strategy is to be how the best old-world content creators adapt to the next era of video consumption. “Cool” Factor – TV shows that want to seem hip and relevant on mobile could appeal to a distinct and lucrative demographic by being featured in Snapchat. It’s established a brand of being where kids want to hang out, rather than just being a utility. LA Entertainment Connections – Unlike most tech giants that are based in Silicon Valley, Snap’s headquarters is in LA, alongside the entertainment industry. It could leverage its proximity and network to strike exclusive deals to host the most compelling content ported from TV. Experience Developing Originals – Snap didn’t start by trying to convince TV networks and studios to produce expensive Shows for its unproven platform. It first worked with publishers like Cosmopolitan and People to update the idea of a print magazine for mobile, combining cheaper text content with short video clips and animations. The success of Discover likely boosted the confidence of TV studios that Shows would reach a sizable audience. Tap to Fast-Forward – While Snaps can only last 10 seconds (unless you’re shooting on Spectacles), laced together they can form longer Stories that users have grown accustomed to skimming through thanks to Snapchat’s tap to fast-forward feature. That means even if they’re getting bored with a Show, they have another option beyond just closing the whole video or clumsily scrubbing through with a more laborious finger movement. This makes Shows feel more watchable on Snapchat than they would on a platform like Facebook. Plus, perhaps most importantly for Snap’s revenue and future share price, the winds of change are blowing in its direction. While it hardly talked about Shows in its S-1 filing, it sure made its case that it could be teens’ replacement for TV. Indeed, eMarketer and IDC say U.S. adults spend 26 percent of their time consuming content on mobile devices, but only 13 percent of U.S. advertising goes there. That imbalance forecasts a ton of advertising dollars shifting to mobile, and Snap stands to soak them up. The tech world has talked about the impending doom of television for at least a decade now. It still hasn’t happened. But maybe that’s because there was never a suitable replacement. While YouTube made bedroom videographers into stars and Netflix created traditional-length shows for the internet, neither were built for the vertical future of video on mobile. Competitors such as Instagram may muscle in on the user-generated Stories that got Snap this far. Chat may be fragmented across a half-dozen apps. But Snap’s success doesn’t depend entirely on it being a social network. It’s shrinking Hollywood so it fits in your pocket.